Duxelles is a French concoction consisting of minced mushrooms and shallots or onion cooked in butter or oil until it is very soft and dry. The mixture is used for all kinds of stuffing: in omelets and boned chicken, for example, and maybe most famously as one of the ingredients in beef Wellington. It’s a terrific, versatile product, and I like to have it around if only to make a quick savory bruschetta for last-minute company. Mushroom duxelles is packed while still hot in sterilized jars, covered with oil, and refrigerated. Any spoilers that might be in the jar are retarded by refrigeration, and new spoilers can’t penetrate the oil layer. Duxelle lasts about ten days. Heat the oil in a large non-stick skillet over a medium heat. In batches of about 3 cups, add the shallots and mushrooms and sauté until the mushrooms give up their liquid, and the liquid evaporates, about 10 minutes. (Don’t cook all the mushrooms and shallots at once because then the skillet will be crowded and the mushrooms will steam rather than dry out.) 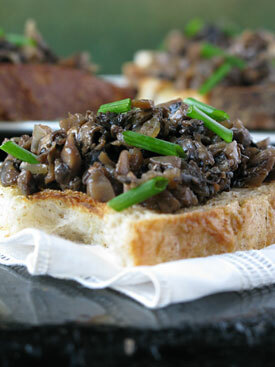 Once all the mushrooms are cooked, return them all to the pan, and add the Marsala wine and salt and pepper to taste. Continue cooking until the duxelles is quite dry and the mushrooms are just beginning to take on a golden color, another 10 minutes. Bring 3 half-pint jars, their lids and bands to a boil in a large pot of water with a fitted rack. Boil for 10 minutes. Remove the jars with tongs (the tongs don’t need to be sterilized). When the jars are dry but still hot, pack the duxelles in as tightly as you can. The more air you push out, the better. Cover with high quality Italian olive oil. Wipe the rims clean of mushroom residue. Screw on the lids and rims and refrigerate promptly. Check the duxelles a day after you make it: you may need to add more oil to ensure it is completely covered. The duxelles will be good for at about 10 days. To use, pour off the oil, spoon out the amount of duxelles you need, pack the remaining duxelles down into the jar, cover with oil, and return it to the refrigerator.